These cardamom sticky buns are a delicious breakfast or dessert. 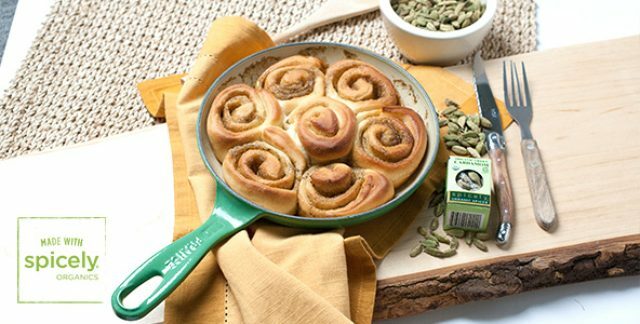 Light and fluffy buns with a sweet cardamom syrup is bound to be a family favorite. This recipe makes 12 rolls. Stir together milk, yeast, melted butter and brown sugar in a large bowl; let sit until foamy, 10 minutes. In a medium bowl, whisk together flour and salt; add to milk mixture and stir until a dough forms. Transfer to a lightly floured work surface and knead until smooth, 5–6 minutes. Transfer dough to a lightly greased bowl and cover with plastic wrap. Let sit until nearly doubled in size, about 1 hour. While you're waiting for the dough to rise, make the cardamom filling. Cream all ingredients together and set aside. Uncover and punch down dough. Roll out dough to 1/4 inch thickness and spread filling, roll up, then cut into 12 equal pieces. Transfer to a greased 8″ cast-iron skillet or 8" x 8" baking pan, nestling them side by side; cover loosely with plastic wrap and let sit until doubled in size, about 1-2 hours, depending on how warm your kitchen is. Heat oven to 325°. Bake until puffed and pale golden brown, 20–22 minutes.